Whoopi Goldberg (left) and Angela Bassett star in 1998's "How Stella Got Her Groove Back"
This week marks 20 years since Stella got her groove back … and she’s still got it. The beloved 1998 rom-com “How Stella Got Her Groove Back” saw Angela Bassett — at the peak of her movie career — and the illustrious Whoopi Goldberg pack their bags and head to Jamaica with fresh-faced newcomer Taye Diggs, in his first film role as young, handsome islander Winston Shakespeare. Back then, 27-year-old Diggs was best-known for originating the role of Benny in Jonathan Larson’s “Rent. The film also marked the feature debut for director Kevin Rodney Sullivan. But it’s not always women revealing their love for the movie, he said, and they’re not always black. Though “How Stella Got Her Groove Back” centers around black characters and tells a story from a black point of view, it definitely feels universal, and the wide net it’s been able to cast around audiences is proof. “How Stella Got Her Groove Back” pulled in $37.7 million at the box office for Fox in 1998, and had a production budget of $20 million. If released today, Sullivan said maybe it would have gotten an international release, and he’s sure it could have performed well in some foreign markets. But “How Stella Got Her Groove Back” wasn’t simply a black story, the film was also heralded as a feminist battle cry, while at the same time being criticized as a frivolous fantasy romp. “I knew I wasn’t going to be dressing up in any tuxedoes for this one,” Sullivan said, referring to it’s lack of awards season accolades. That aside, there was a responsibility to get it right and tell the story of a 40-year-old single mother searching for happiness in the wake of a divorce justice. “How Stella Got Her Groove Back” was adapted for the big screen by author McMillan from her New York Times best-selling novel of the same name. Bassett embodies Stella, a successful, hardworking, 40-year-old single mother in desperate need of a little relaxation and romance. Enter Goldberg, as her college best friend Delilah Abraham. Goldberg, who had already won an Oscar for her supporting actress role in “Ghost,” convinces Stella to take a first-class vacation to Jamaica. There she meets, is romanced by and falls in love with Diggs’ character, a “not even legal” 20-year-old college graduate. Stella Payne is easily on Bassett’s Mount Rushmore of iconic film roles. It’s one moviegoers surely remember, which is saying a lot for an actress who’s taken roles in “Boyz n the Hood,” “Malcolm X” and “What’s Love Got to Do with It,” to throw out a few. Though Sullivan sat at the helm of the film and Diggs served as the catalyst for Stella getting back her groove, it was the female talent involved that’s driven it to enduring success. "How Stella Got Her Groove Back" turned 20 on Aug 14. The film, adapted from Terry McMillan's best-selling novel, introduced the film community to Taye Diggs, then a broadway actor known for "Rent." It also gave Angela Bassett one of the defining roles of her career. 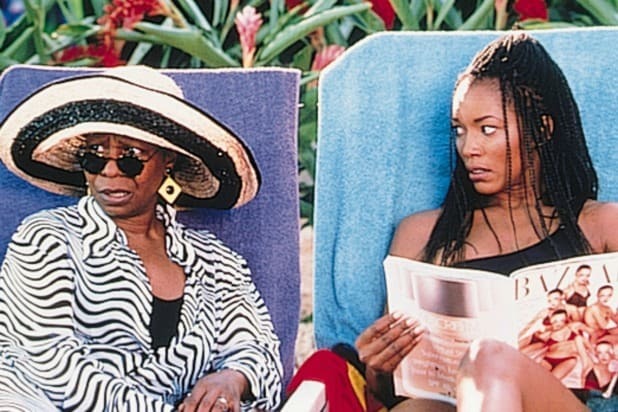 Her Stella character is an overworked single mom in need of a vacation and some romance, so best friend Whoopi Goldberg takes her to Jamaica, where she meets and falls in love with Winston Shakespeare (Diggs), a man 20 years her junior. RollingStone critic Peter Travers said of the film: "Whether you regard Stella’s getting her groove back as a feminist battle cry or as a silly wish-fulfillment fantasy, the movie delivers guilt-free escapism about pretty people having wicked-hot fun in pretty places." Spike Lee's feature film debut, "She's Gotta Have It," has to be considered the quintessential black rom-com. The film, which Lee updated as a Netflix series, tells the story of Nola Darling and her three unique boyfriends. It's been heralded as helping to usher in the indie film movement of the '80s and changing the representation of black people in American cinema. Probably more comedy than romance, but Eddie Murphy's 1988 rom-com "Coming to America" is a classic in either genre. This fish out of water tale follows Prince Akeem (Murphy) of Zamunda on his journey to America, fleeing an arranged marriage. Landing in New York City, he and his sidekick Semmi (Arsenio Hall) try to acclimate to American life, while trying to find a wife of his own. The film also marked the first time Murphy dressed up to play more than one character. Another Eddie Murphy film makes the list. This time there's no need for him to play any other characters because he's joined by Halle Berry, Martin Lawrence, David Allen Grier, Grace Jones, Ertha Kitt and Chris Rock -- need we say more? "Boomerang" is your prototypical rom-com, with a little signature Murphy. He plays a New York marketing exec and womanizer, Marcus. But what goes around comes around in this romantic comedy, leading Murphy's character to find and realize true love. You would be hard pressed to find a more charming, more attractive pair to co-star in a black romantic comedy in the '90s outside of Larenz Tate and Nia Long. "Love Jones" follows the love at first sight and up and down relationship of two young black artists in Chicago. In an oral history of the film for it's 20th anniversary, Tre'Vell Anderson wrote for the Los Angeles Times: "'Love Jones,' at its core, is about possibilities, those opportunities people of color know exist for them -- in love, life and career." It's the rare (black) rom-com that warranted revisiting with a sequel, some 14 years later. "The Best Man," staring Taye Diggs, touts an ensemble cast of Diggs, Nia Long, Terrence Howard, Morris Chestnut, Harold Perrineau and Monica Calhoun as a group who come together for their friends' wedding only to have old flings, feelings and drama resurface thanks to a new, semi autobiographical book Diggs' character Harper wrote that threatens the wedding and friendships. "Love and Basketball" isn't exactly a romantic comedy, but this coming of age young love story written and directed by Gina Prince-Bythewood is a classic. The film follows the friendship and relationship of Quincy (Omar Epps) and Monica (Sanaa Lathan) as they grow up and pursue their shared dream of playing professional basketball. The film abandons comedy and instead culminates in a one-on-one basketball game for the future of their relationship that will surely make your heart ache. This Vivica A. Fox-Morris Chestnut rom-com pulls from a familiar story: A self-assured relationship veteran finds herself having difficulty maintaining a relationship. In "Two Can Play That Game" Fox's character puts forth an all-out assault dubbed the "10-day-plan" in order to get Chestnut crawling back to her. This list clearly needed more representation from Taye Diggs and Sanaa Lathan. Their 2003 rom-com boasts supporting roles from Queen Latifah and Mos Def. In "Brown Sugar" Dre (Diggs) and Syd (Lathan) have been close friends since childhood, but after Dre proposes to his girlfriend Syd realizes that her best friend might actually be the love of her life. It's a take on William Shakespeare's "The Taming of the Shrew." In "Deliver Us From Eva," which stars Gabrielle Union and LL Cool J, Eva is an uptight single woman meddling in her sisters' love lives. To keep her from disrupting their relationships the sisters' boyfriends pay notorious ladies man Ray to romance her, date her and break it off a few weeks later. But of course, they fall in love. Eleanor Ringel Cater wrote for the Atlanta Journal Constitution when the film came out: "Not only is this a funny and romantic movie, but it proves, yet again, that movies can and, in some instances, should be colorblind."